If you are like me then following the well-earned summer break you return to teaching in September and feel like you have forgotten everything from how to explain an idea to how to write on a whiteboard and that comes after forgetting all your passwords and how to log in on the staff network. Once you’ve completed the staff training inductions, had your morning coffee and got back into the classroom there is always the awkwardness of the first few lessons and the dreaded ‘breaking the ice’ rituals. For the subject of Sociology then there is no doubt that discussions and debates are an essential learning tool (as well as being the best part of teaching in my opinion) but just how do you get the students to open up and feel comfortable doing this straightaway? Firstly, let’s establish just how important discussion work is, the leading practitioners in pedagogy are all pretty much in agreement that it is one of the most effective forms of learning for students. Author of ‘Visible Learning’ John Hattie places ‘discussion work’ at a scale of 0.82 for effectiveness (the average effectiveness being 0.4). Stanford university professor Carol Dweck has long argued that regular and consistent questioning can improve ‘brain plasticity’ by cultivating a stronger mindset and a desire to learn new challenges as well as retain previously learnt information. This view is support by Helen Timperley, the author of ‘Realizing the Power of Professional Learning’ who advocates the use of spiral discussions whereby you continually refer back to the same questions time and again, she also promotes the use of probing questions in particular noting that students often thrive on a challenge and that really challenging questions can actually be the most interesting from the point of view of the student. So, this is all very well, we know that discussion work is important and arguably more important in subjects like Sociology than some other subjects but how do you get students to open up, especially the shy and quiet ones? I teach in an international college and this can often present an even bigger challenge as some cultures are used to teacher led lessons with minimal interaction from the student. Also, what are some of the questions that get students interested especially in those daunting first few weeks? Firstly, it is difficult to launch straight into a debate, whilst you will always have some confident speakers you are in a danger of intimidating the others and leaving them cut adrift. Therefore, to make sure everyone is involved my starting point is always the mini-whiteboard, this is a nice half way house between students collecting their ideas and having to actually say them out loud. I am sure that many of you use this technique but asking students a question and getting them to write their ideas on a mini-whiteboard does not feel as intimidating but it does give them a sense of personalisation. I ask the students to hold up their ideas before they have to say anything; this again breaks them into sharing their individual ideas without the pressures of verbal feedback…….yet. The next step is just to get the students to say a single word and thus easing them into speaking in front of others, I often put a statement on the whiteboard and then go around the class and ask them to simply say ‘agree’ or ‘disagree’. This proves really interesting as many students want to say more to justify their answer and of course if they are comfortable doing this then it should be actively encouraged. Students will often say more than is required if they are not feeling pressured to do so but rather it is their own choice to divulge the information. Depending on the size of your class then small group discussions rather than whole class discussions is a good path to take next, perhaps in groups of four with two arguing for a debate question and two against. Many students will obviously feel more comfortable in a small group discussion but it is still getting them used to using their voice in front of others. You can then ask each small group to feedback to the rest of the class making sure that each student states at least one point. Once you have eased the students into talking in front of others then a whole class discussion should be a natural step up. I often use a toy cat (a bagpuss toy if you must know) which is passed around the class in debates, only the person holding the toy cat can speak. The cat must be given to a different student each time so that all students have a chance to speak. At some point you will have a student who freezes and says nothing of course, it is important to leave an awkward silence as often the student will eventually say something, but what if they are really struggling? Well I allow each student one ‘Pass card’ whereby they can pass over to another student, the key to this is that they can only use the pass card once in a debate or discussion. It is certainly a skill to get a discussion going and of course some groups are always going to be better at it than others, that will always be the case but there are certainly some techniques that are tried and tested. William E. Cashin from the Kansas state university says it is important to get the discussion technique right, he advises asking general (divergent) questions regularly, to avoid looking only at the student talking, control excessive talkers, ask for examples and illustrations, be sensitive to feelings and emotional reactions and always encourage and recognise students’ contributions. So, my advice is to break into the discussions gently, do not expect too much too soon and keep it well managed. If you really have a quiet group or are looking for a spark then the debate on ‘Should a man pay on a first date’ usually does the trick! Matthew has been teaching Sociology for 15 years and has taught in the UK, Kenya and Spain. He currently teaches at Bellerbys College in Brighton. Matthew runs the www.podology.org.uk website and plans to visit every country in the world (74 so far and counting). 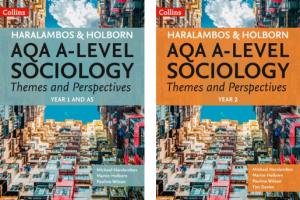 He is also a contributor to the new AQA A-level Sociology Themes and Perspectives books. Visible Learning. John Hattie, 2011. Realizing the Power of Professional Learning. Helen Timperley, 2011.